National BJP Leader from Punjab Sukhminderpal Singh Grewal launched and takes part in cleanliness drive with BJP workers and shopkeeper Association. Grewal launched this drive from the statue of Shaheed-e-Azam Sardar Bhagat Singh Ji, at Bus Stand Jodhan near Ludhiana. Grewal told that this drive is called by Hon'ble Prime Minister of India Sh. Narendra Modi on launched the country's biggest ever cleanliness drive that is expected to cost over Rs 62,000 crore, asserting that the "Swachh Bharat" mission is "beyond politics" and inspired by patriotism. Talking with the media persons here today Grewal all the Government 's in this country in each and every state have made one or the other effort to do this work. He told that several political, social and cultural organizations have made efforts in this direction for the 5 year long campaign that will cover 4,041 statutory towns of the country. Grewal said that this task is not the responsibility only of safai karamcharis or the Government but of all the 125 crore Indians. He said that he is aware that the criticism of this programme will begin in just a few days but said he is prepared for this exuding confidence that the countrymen will not let him down. Grewal stated the launch was preceded by cleanliness campaign week beginning September 25 which saw Central Government and State Government offices being spruced up by discarding or overhauling old furniture and sending old files to record rooms. He said that the launch of the mission comes in the wake of a perception about Indian cities not being very clean. Grewal said that a large number of people in rural areas still do not have access to toilets. He said that some schools in the rural areas also do not have toilets. Grewal told that according to the Census 2011 and only 32.70 per cent of rural households had access to toilets. He also told that according to a UN report released this year, India continues to have the largest number of people in the world defecating in the open. Grewal said that our Hon'ble Prime Minister Narendra Modi has been talking of "Clean India" in his major speeches, and most people feel that personal push being given by him to sanitation would have an impact. Grewal said that a "clean India" will be the best tribute to Mahatma Gandhi on his 150th birth anniversary in 2019. The Father of the Nation had a penchant for cleanliness in his personal habits and strongly promoted it in society. 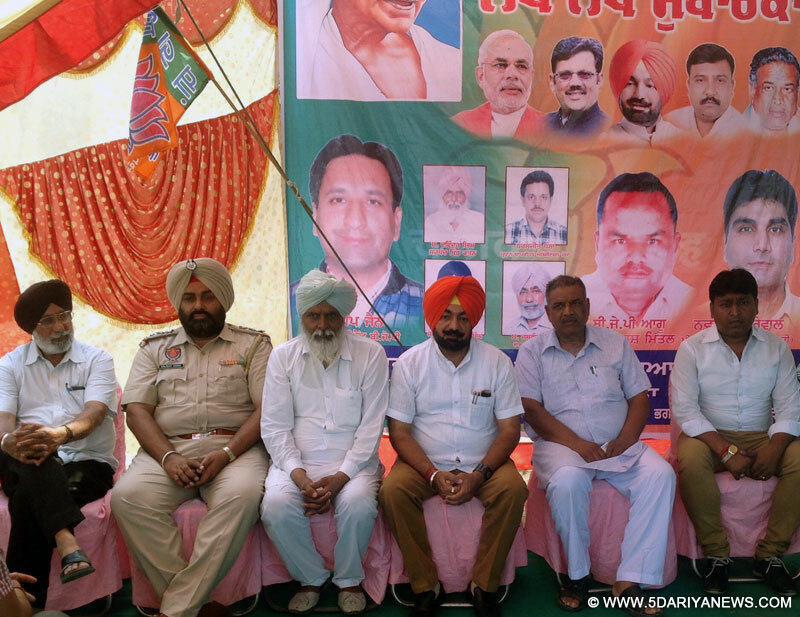 In this drive District President Jagraon Dr. Shrishti Garg, Vice President's Pardeep Jain, Navdeep Singh Grewal, General Secretary Dr. Ajaib Singh Chahal, Secretary Bs Dhillon, Ram Parkash Mittal, Dr. Bishamber Nath Baddowal, Mahinder Dev, Chairman shopkeeper Association Rakesh Kumar, President shopkeeper Association Parmjeet Singh Pamma, Shmt. Balwinder Kaur Dhillon, Sarpanch Jodhan Jagdev Singh, Jathedar Ajmer Singh, Devinder Singh, Gurjeet Singh, Gurmeet Lal, Dalwara Singh all from village Rattana, Pardeep Singh Masuran, Bharat Kumar Mullanpur, BJP Yuva Morcha Leader Anil Kumar, Raj Verma, SHO Kuldeep Singh, ASI Harpreet Singh Punjab Police from Police Station Jodhan and large number of local resident participated this drive.